What do ocean liners and buses have in common? You wait ages for one, and two come along at once. In this case, the RMS Alaunia and SS Oceana, which lie close to each other and the Sovereign Tower near Eastbourne, East Sussex. With the right tides both can be dived on the same day. Unsurprisingly, this is a popular trip so finding a space on a hard boat is half the challenge. 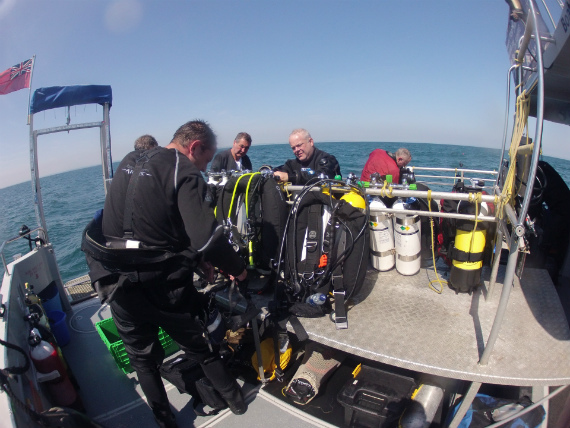 Luckily, our trip organiser was on the ball and somehow found a midweek slot for the six of us on ‘Channel Diver’ departing from Eastbourne. It’s a spacious hard boat with excellent fitments (including lift), which was lucky as it was metaphorical standing room only: clearly half a dozen others had skivved off work with the same idea. Weather on the day of our visit was as good as it gets, with clear blue skies and barely a puff of wind. I splashed with Chris C and we dropped down the shot through the snotty green water, as the numbers on the wrist started to climb. And the Alaunia came into view. Whether you’re ‘into’ shipwrecks or not, you have to admit there’s something special about size. And this one was big: weighing in at 13,405 tons, she was built in 1913 for the UK-Canada route but was requisitioned in WW1 for troop duties. In 1916 she struck a mine and desperate attempts to beach her failed. 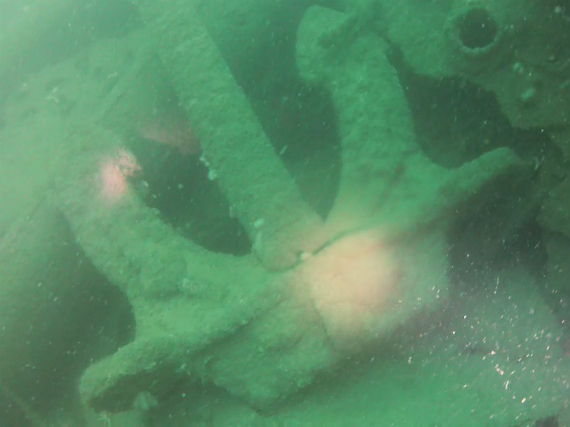 The wreck was extensively salvaged, and although parts of her are borderline ‘splat wreck’ enough remains to give me the thrills. The bow section in particular is epic. Heeled over at about 70 degrees, the decking is still visible with the huge winches on deck and the port anchor hanging down mid-water. A second (spare?) anchor lies in the wreckage. 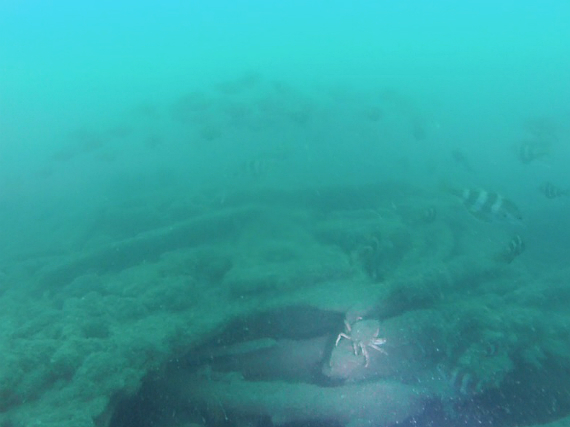 We swim around the tip of the bow and back into the debris field. Along the way there are portholes visible, or at least the holes where portholes were once fitted, doorways and windows. There are pipes and ropes and hull plates and girders and winches and rivets. And there are fish, ye gods are there fish: thousands of them, great schools of bib in particular, as well as some huge pollock, edible crabs and spider crabs. 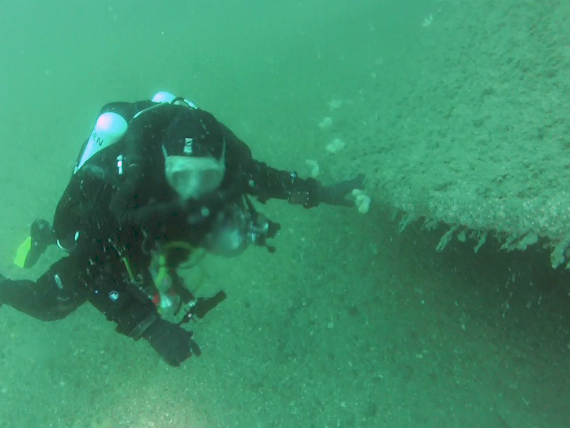 We barely cover a third of the length of the wreck before racking up deco, so this is definitely one I want to come and explore again – ideally with a scooter. 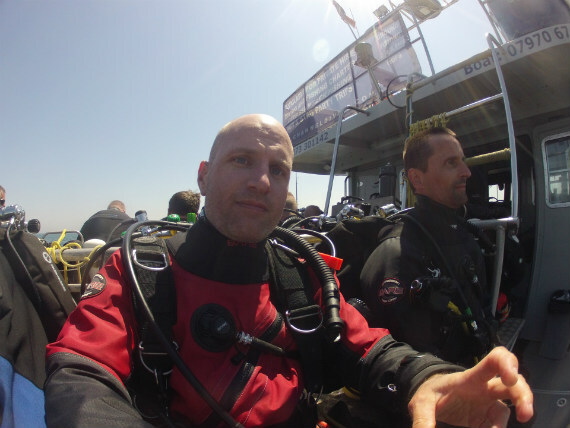 After a decent surface interval spent drifting nowhere in particular, we splashed in again on the SS Oceana. 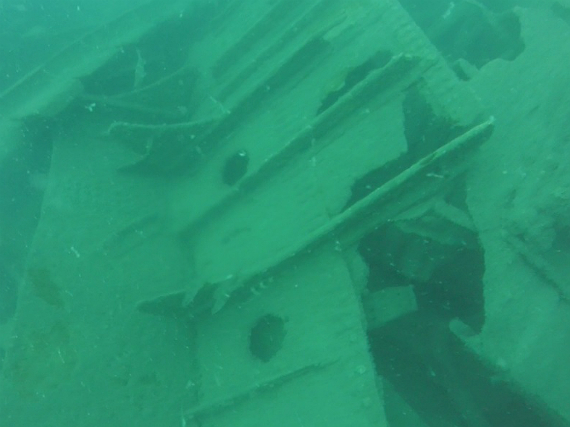 This one’s a steamship from a slightly earlier era (built 1887) and sunk in 1912 after a collision with another ship. She’s been extensively salvaged and dynamited, due to being a shipping hazard, so the picture is not a complete one. The Oceana was also carrying gold and silver ingots worth about £3million, which explains much of the destruction. 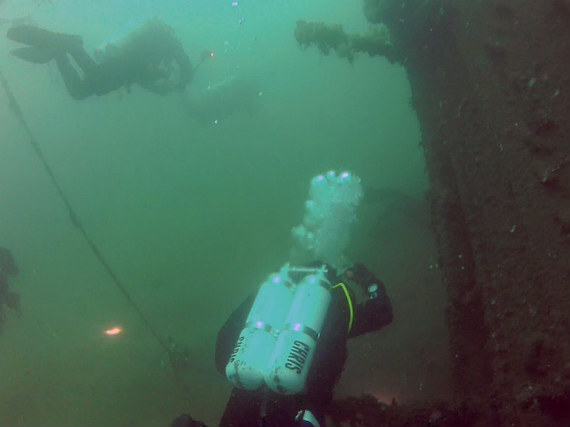 Nonetheless there are still upright sections of hull standing about 10 metres proud and we swim around the stern to see the rudder and assembly still in an upright position. 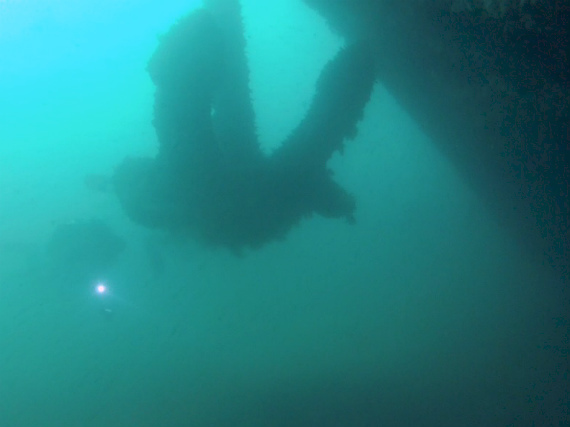 As the gas ticked down, it’s time to go home and we begin our ascent, Oceana disappearing into the gloom below. We’re joined at the deco stop by several fairly large jellyfish, pulsating peacefully in the water with long tentacles streaming behind them.